We call it the Belarusian pride: the cleanness and greenness of its cities. This is probably one of the first things foreigners notice after spending some time in Belarus. And it is also the first thing you will hear from a Belarusian when they are talking about their country. And for a good reason too! Large green parks are a typical Belarusian feature. In Minsk you may come across the central children’s Gorky Park, the huge, pine-filled Park Chelyuskintsev, and amazing Botanic Gardens. You can find many smaller parks throughout the city, even far from the center. They all have interesting sculptures that remind you of the Belarusian past. It seems that a lot of people are responsible for the greenness in Minsk and other cities. In the summer a group of people in green uniforms appear and do their work. They do it diligently, taking good care of the soil, the trees and the beautiful looking flower beds. The result is visible, touchable and smellable. Thank you, green ladies and gentlemen for such an oxygen treat! There is a big respect for the green grass area especially in the cities! You won’t find people walking on the grass, but instead they will walk carefully around it. Sometimes, when taking a shortcut (meaning walking on the untouched grass), you can’t stop but feeling like you any moment can step on a mine (why else would no one walk here?). No one can disagree with the cleanness in Minsk and Belarus. Why are the streets of Belarus so clean, we wondered many times? Is it because it benefits from a lack of tourists clogging the streets? Or are there a huge amount of trash bins spread out through the country? 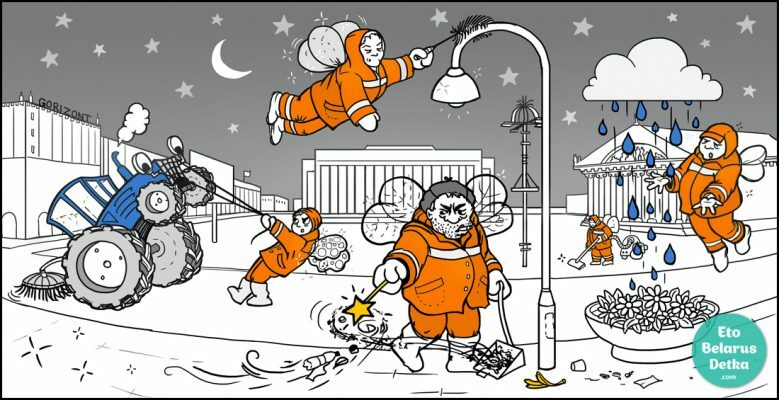 Or does it have to do with the delegation of Municipal Orange Fairies that come to clean the streets? To all three of the above questions we can surely respond with a YES! Not much tourism is happening in Belarus. Many trash bins are located in the cities. And you will find many fairy-like ladies and gents in orange uniforms with only one thing on their minds. And this is: to get rid of all the dirt and waste the city has collected during the day. Usually in groups of three or more, they gloriously roam the dark streets, meticulously cleansing every corner.